We offer the complete line of Evinrude E-Tec and Mercury Four Stroke outboard motors. Our inventory changes regularly so please contact our sales team at (715) 924-3318 for the latest availability and current prices. Evinrude Outboard Motors is an American manufacturing company producing the Evinrude E-Tec motors. Founded by Ole Evinrude in Milwaukee, WI in 1907, they have been a subsidiary of Bombardier Recreational Products, or BRP since 2001. Evinrude produces a complete line of outboard motors to meet all of your engine needs and requirements. Evinrude produces two-stroke, direct-injected engines ranging from 25 hp to a 3.4L V6 300 hp. They also manufacture a line of smaller carbureted, two-stroke engines ranging in size from 3.5 hp to 15 hp. In 2001, when Bombardier acquired the Evinrude, they worked diligently to engineer and improve the E-TEC direct injection, as we know it today. This new engine improved fuel efficiency and reduced emissions, oil usage, noise levels, and maintenance needs. This is due in part by a pin point oiling system which only applies oil to the necessary components, unlike the original two-stroke motors. Evinrude has placed their engines into four separate series for consumer ease and understanding. 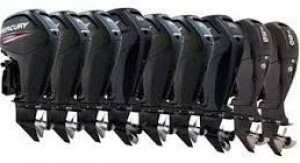 They have the G2 series, the E-Tec series, the Pontoon series and the Portable series. To learn more about these series, please proceed to the Learn More section of our website. Mercury Marine was founded in 1939 when engineer Carl Kiekhaefer purchased a small outboard motor company in Cedarburg, WI. Kiekhaefer's original intention for the Kiekhaefer Corporation was to make magnetic separators for the dairy industry. The purchase included 300 defective outboard motors. Kiekhaefer and a small staff of employees rebuilt the motors and sold them to Montgomery Ward, a mail-order company. The motors were much improved so the buyer purchased more. Kiekhaefer designed motors that withstood the elements better than his competition and called the motor Mercury after the Roman god. Kiekhaefer took more than 16,000 orders at the 1940 New York Boat Show. Over the years, Mercury has provided such innovations as the MerCruiser stern-drive line which later took over 80 percent of the world market, electronic ignition and electronic fuel injection for outboards. Carl Kiekhaefer resigned as President of Kiekhaefer Mercury in 1969, and the name was changed to Mercury Marine. Today they manufacture four stroke outboard engines ranging from 2.5 hp to 350 hp. 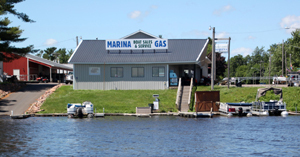 They provide engines for private, commercial and government sales, primarily for small boats. There are four distinct model offerings including the FourStroke, Opti-Max, Pro-XS and Verado.